Clinton Heylin sort of spoiled Bootleg Series v6 for me. On the Wikipedia page for this 2004 release, Heylin is quoted as saying: “I’ve never rated [the Halloween show] as a performance. Dylan is very focused when he comes to doing the new songs…But the old material, he’s completely and totally bored with. It’s not a good performance. He’s clearly stoned…The concert was a real landmark, not in the positive sense, but in the negative sense because it looked at the time like Dylan was going off the rails”. I re-listened to this album, which captures a Dylan show from 1964, for the first time in forty weeks because it was the only Dylan release of 2004. My first thoughts were that it is a pretty remarkable show for a twenty-three year old just on the cusp of becoming a superstar, and that the variations on some of the then unrecorded material makes for some fascinating listening. I was struck by the different relationship of Dylan to his audience – here he jokes around quite a bit and makes some goofy comments, while the more contemporary Dylan can go years without directly addressing his listeners (though he still retains a penchant for dumb jokes from the stage when he does talk). But Heylin’s comment: “He’s clearly stoned” stuck with me. Those three words just jabbed right into my brain. You can’t unhear them. The problem is that now when I listen to the introduction of “Who Killed Davey Moore?”, where Dylan just rambles and rambles like, well, like someone who is clearly stoned, all I can hear is the pot talking. So thanks for that, Mr. Heylin. Implicit in Heylin’s comments is the idea that there were better concerts in 1964, and, possibly, that there are better shows out there for the collector. If there are, I don’t have them. I have only two complete or semi-complete shows from 1964 (San Francisco and San Jose, both from late November – a month after this show). I can’t really compare them to this because the sound quality is so poor (on one of them, the bootlegger – or someone close to him – starts to sing “To Ramona” with Dylan, but, fortunately, stops himself). Here’s the thing: those might be better shows, but the recording technologies of 1964 being what they were, you’d never ever know it. 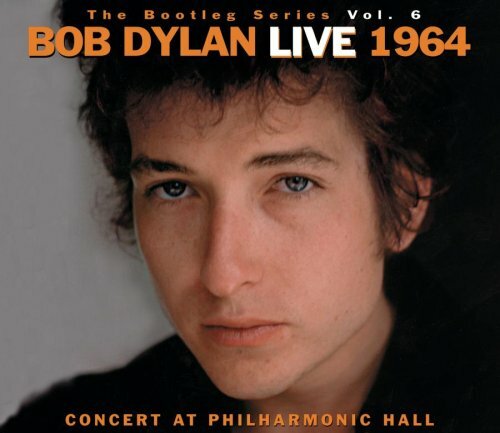 One of the things that is great about Bootleg Series 6 is that the sound is terrific. In balancing releases like this Sony is torn between the best shows and the recordings of shows. When I was digging through Springsteen bootleg sites and discussion boards last week, I ran across a thread discussing the best sounding Springsteen shows – not the best performances, but the best job that people had done at capturing the sound. It was a really interesting discussion – someone posted a list of about 100 bootlegs arranged by year as well. I could totally relate, as now I’ve become quite picky about recording quality as well. I’d rather listen to a good Dylan show well recorded than a great one that has a lot of audience noise, for example. What you get on Bootleg Series 6 is a truly superior recording. Maybe it’s not the best Dylan show of that year – I can believe that – but it’s still a good show (sorry, Heylin, it is). I just need to fast forward past the rambling that precedes “Davey Moore”. Of the six Bootleg Series releases so far this one is my least favourite, but I’m happy to have it.